In addition to pursuing a rigorous academic course of study, a central focus of high school is the development of agency–students’ belief that they are in control of their own lives and can act of their own free choices. 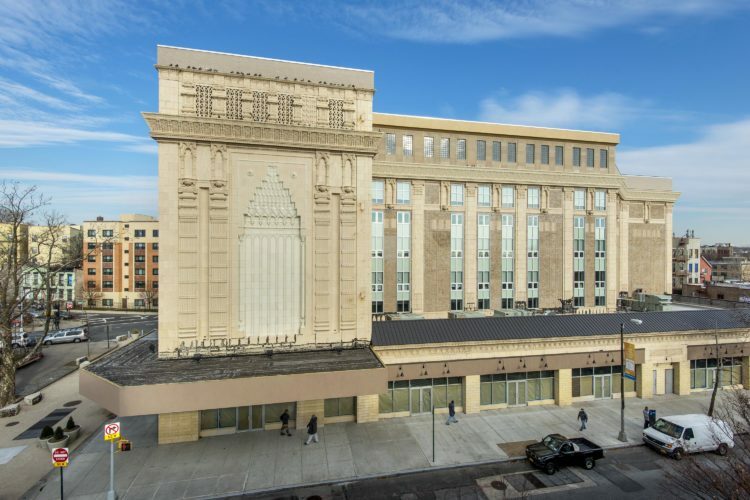 This capacity will prove essential for college life, where freedom and responsibility will be exercised in a nearly complete absence of supervision. At Ascend, the focus is not merely on college acceptance, but college completion. Partnerships with colleges, universities, and college financing organizations, together with an Ascend alumni program, will ensure that students have the supports to overcome obstacles and persist in college. our high school students continue to out-perform students citywide. 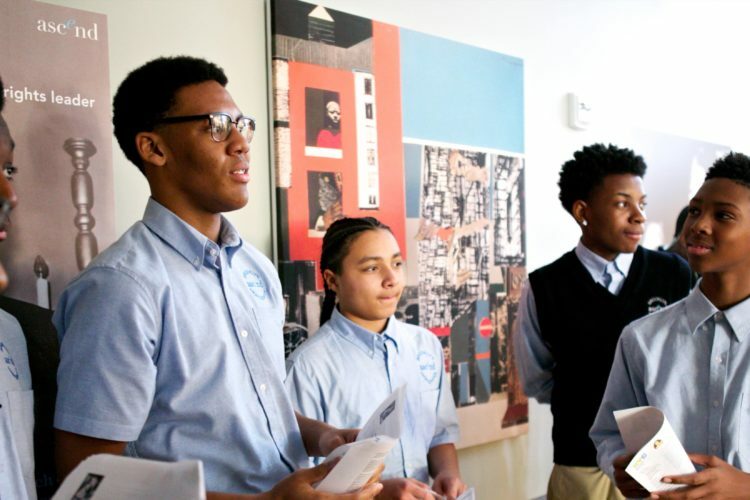 Building on the strength of the Humanities Program in grades five through eight, the high school curriculum aligns English and Composition with the History sequence, where students will study Global History, United States History, and Economics. Students will graduate confident in their critical reading, writing, and public speaking skills, and will have developed the ability to understand, critique, and participate fully in the world around them. 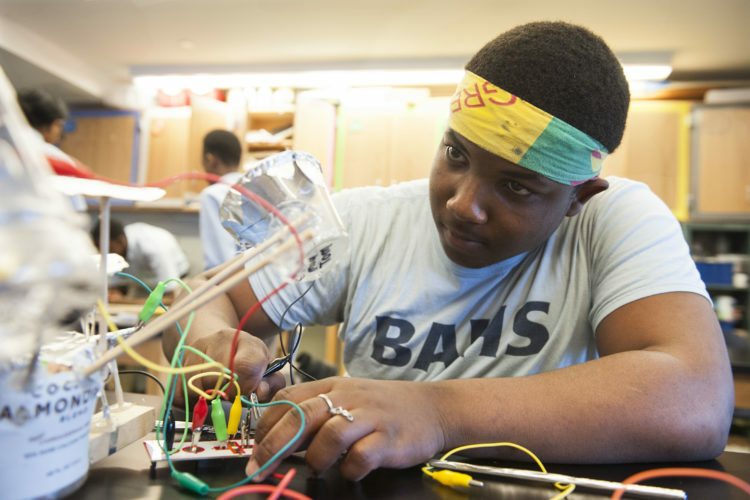 Building on the strength of the middle school science curriculum, high school students continue the study of science and technology to explore issues of importance to them, their community, and society. By learning how to gather and interpret scientific evidence about local and global issues, students begin to appreciate the power of science. They recognize that science is much more than a set of answers to be learned, but rather a way of asking questions. 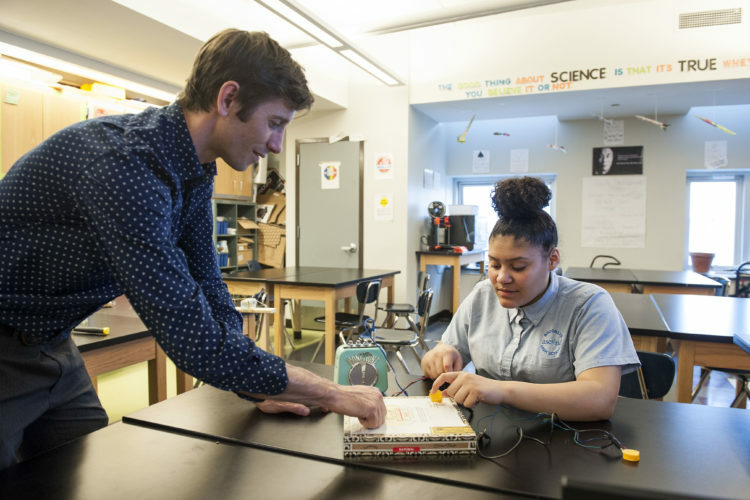 The course of study begins with Biology and Chemistry in freshmen and sophomore year, respectively, and follows with AP Biology and Physics in junior and senior years. The mathematics program is tightly aligned with the Common Core and includes Integrated Algebra, Geometry, Algebra II/Trigonometry, and Pre-Calculus. Advanced students have the option of choosing the honors mathematics track, and all courses ensure a deep understanding of concepts and an ability to apply mathematical concepts to the real world. We offer students a variety of experiences where they can explore hidden potentials and extend beyond their comfort zones. The school participates in the Charter School Athletic Association, with girls participating in volleyball, basketball, and softball, and boys participating in flag football, basketball, and track. Other extracurricular offerings include yoga, introduction to web development, dance, and fitness. Every rising ninth–grade family has a family meeting with school staff prior to September of freshman year, providing an opportunity for school staff and families to begin the relationship that will be a critical element of a student’s high school experience. Throughout high school, workshops, dinners, retreats, and conferences offer opportunities to strengthen the school-family partnership. Workshops include topics such as financial aid, the PSAT and SAT, finding the right college, and planning campus visits. Finally, rather than a traditional parent-teacher conference, students stay at the center of Ascend conferences and by leading the meetings, evaluate their own progress, and identify plans for academic improvement. Advisory plays an essential role, as students check in each morning with an advisor and one another on matters ranging from homework and dress code to family situations to summer internship possibilities, and develop the organizational and executive function skills required for success in high school, while building a strong sense of community. 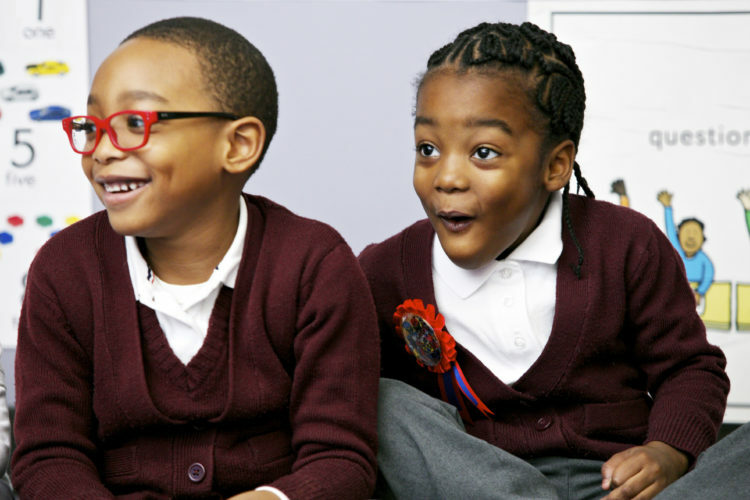 At Ascend, our goal is to close the achievement gap. Today in the United States only eight percent of students from low-income families graduate from college. Our commitment is that every Ascend high school student enrolls in college. But college access does not ensure college success. We are committed to ensuring that once scholars get to college, they graduate. College preparedness includes college-readiness seminars, visits to college campuses, testing support, and faithful maintenance of a college readiness portfolio. The school’s staff includes a director of college counseling and alumni programs and associated staff. Academic preparedness is a necessary pre-requisite for college graduation, but so too are non-cognitive skills and a sense of purpose. It is particularly vital that students believe in themselves and have aspirations for their lives. Through the four-year college seminar, students analyze personal strengths and weaknesses, practice realistic goal-setting and planning, and develop a growth mindset. To foster this sense of belonging and of one’s place in the world, students are expected to complete a significant program of community service. Practical, hands-on experience outside of the school building is critical for students to explore career paths and navigate the real world. Staff help connect students to internships that further their emerging academic and professional interests. A true liberal education—which fosters and prizes critical thinking and independence of thought—cannot be joined to a culture of rigid rule-following and silent meals. It is a flagrant contradiction. Students cannot learn that their voice has power when for much of the day the school stipulates their silence. 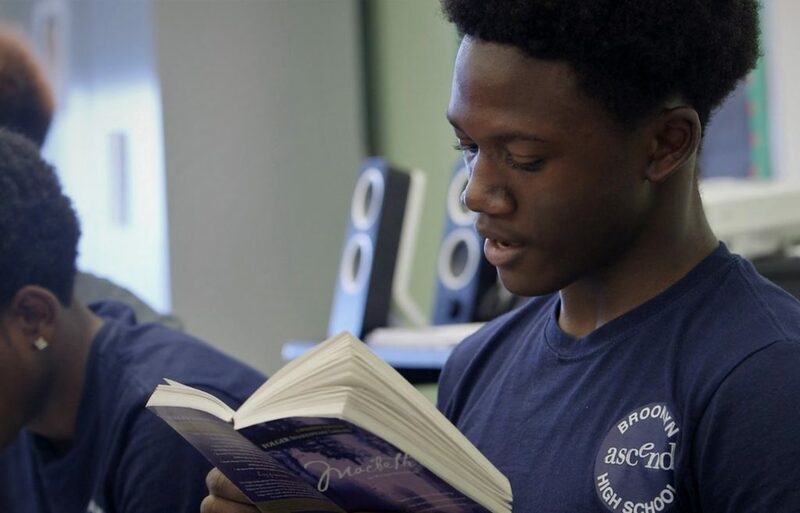 In Ascend’s high school, restorative practices teach students to resolve conflicts on their own, understand the impact of their actions, and acknowledge responsibility to the school community. Such practices encourage accountability and responsibility through personal reflection within a collaborative process. They enable people to listen and respond to the needs of the person harmed and the person who harmed. By the time our students reach college, they will trust in their ideas and self-manage with full autonomy—and take their place at the seminar table with confidence. The high school focuses on developing responsible and empowered citizens; we are preparing students for success in college and in life. To allow students to fully engage in society, their education must develop civic character – the knowledge, skills, and virtues necessary for engaged and responsible citizenship. By the end of high school, students will understand their role within their school, local, national, and global communities. Ascend has developed a warm and supportive culture rooted in restorative practice, departing from a punitive and proscriptive disciplinary model, with its frequently high rates of referrals and suspensions. Restorative practice empowers students to resolve conflicts on their own, gain an understanding of the impact of actions, and take responsibility for choices, while suggesting ways to repair negative actions. In Making and Hacking Music, high school students make their own musical artifacts, starting with the diddley bow, a single-stringed instrument which influenced the development of the blues. 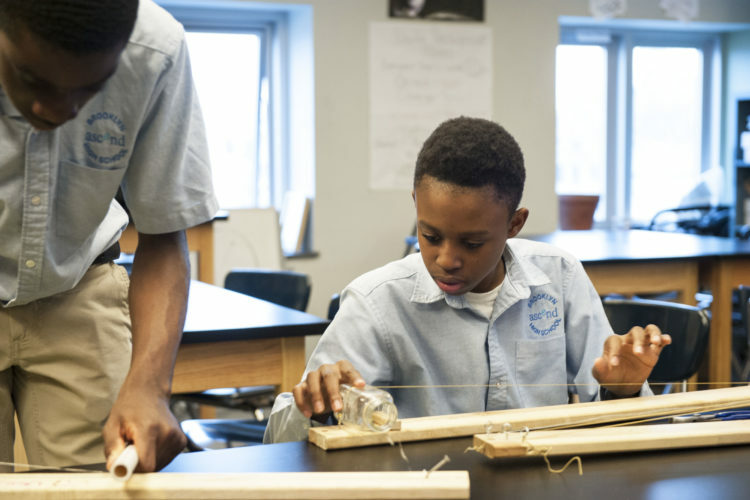 In building their musical instruments, students encounter engineering challenges that engage the science of music, including sound waves and harmonics. How will their choices of materials affect the tones of their instruments? Can they calculate the harmonics of their instruments to design their fret boards? When engineering their tuning pegs, what diameter will afford the desired range of pitch? Each student is paired with an African American musical pioneer. Students read and discuss the influence these musicians had on creating and shaping new genres of American music. 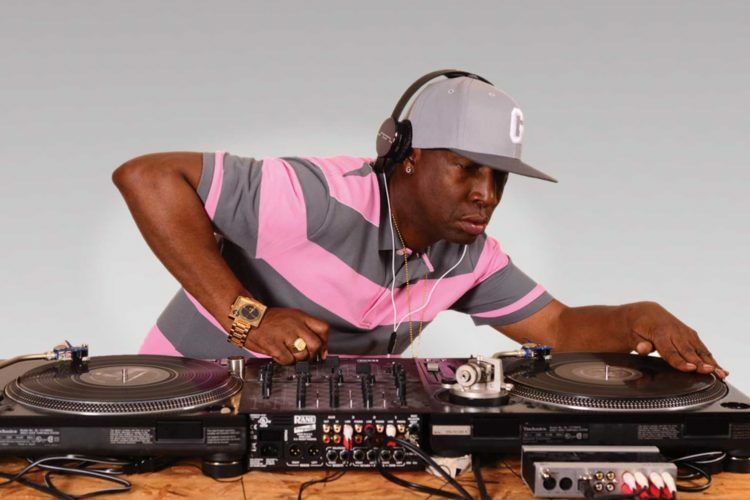 In their final project, students pay homage to Grandmaster Flash by creating Makey-Makey instruments, where touch alone triggers pre-programmed digital sound loops and samples. Circuit design, the properties of conductive materials, the relationship of hardware and software, programming loops and variables—all are engaged in the project's culmination. 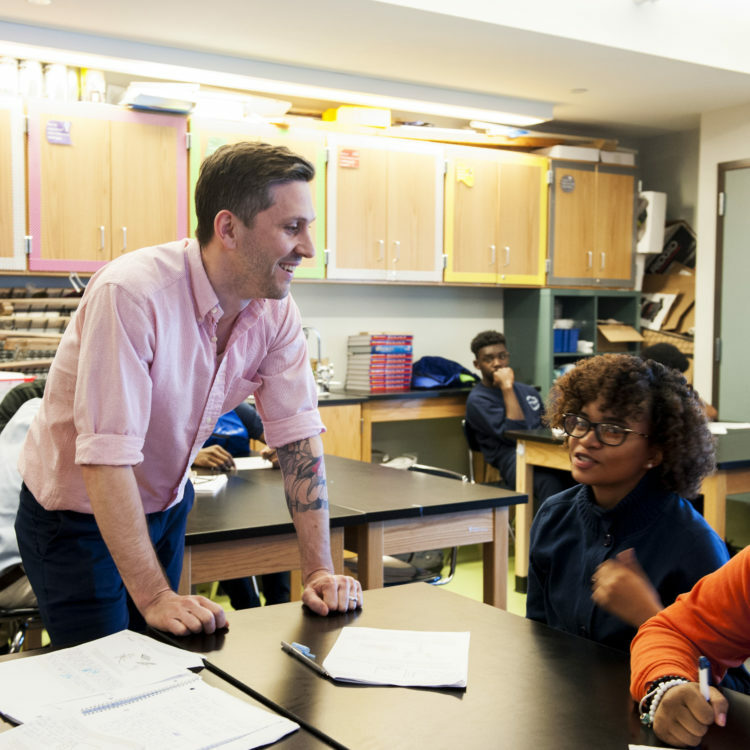 Join our collaborative, intellectually driven educators in building the finest schools in Brooklyn. Find the Ascend school closest to you and enroll now.